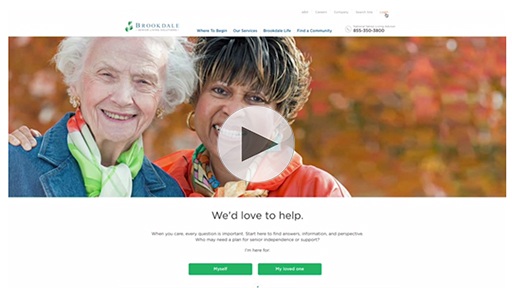 After analyzing millions of Internet visits and interviewing scores of consumers, Brookdale Senior Living has built a new website based on fresh insights into what’s most important to families searching for senior care. The first phase, which is a $4 million investment, went live on brookdale.com mid-August. 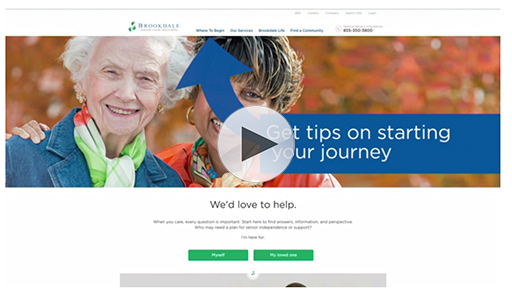 “With Brookdale’s website attracting more than 500,000 visits every month, it’s imperative to make it as useful to consumers as possible,” said David Cygan, Brookdale’s senior vice president of marketing. “As the nation’s largest senior living provider, we know our website is a primary source of information, with many people coming to us first as they embark on this journey,” Cygan said. “It’s important that we offer substantive resources that make it easier to find help in evaluating senior care options.” More than 80 percent of adult children turn to the Internet when they look for care for an aging parent, according to the company’s research. Addresses the confusion and anxiety that can accompany the search for senior care. 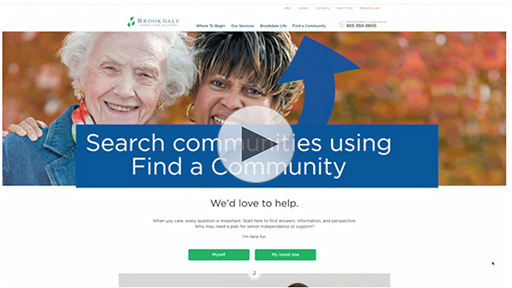 “Our research showed that providing too much community information up front can overwhelm people,” said Michael McCamish, Brookdale’s director of web development. “We’ve streamlined the design to showcase the three features families care about most, which are safety, location and what makes the community unique.” Consumers also want to know how it is situated in the city or town surrounding it, so the redesigned site shows area grocery stores, churches, public transportation and other components of daily life. Offers familiar navigation features. “We are taking cues from other sites, such as real estate, travel and hotel, that brookdale.com visitors are accustomed to using,” McCamish said. 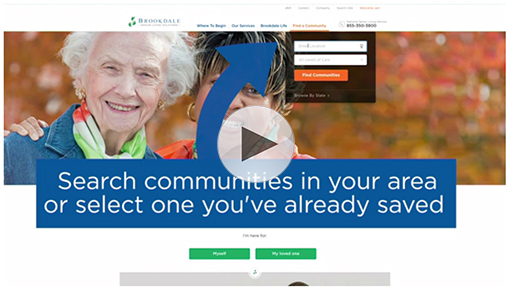 “This means people won’t have to spend time figuring out how to use our site; it will be smooth and intuitive.” McCamish noted that brookdale.com will enable visitors to select top amenities when searching for a community. 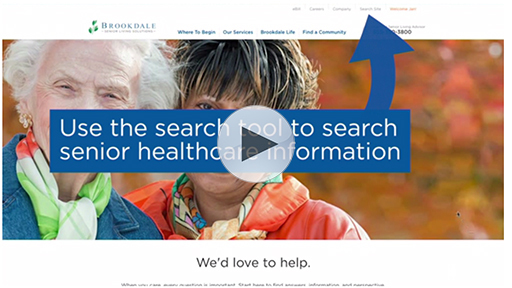 Provides more accessible information and content for consumers from Brookdale subject matter experts. Topics include senior health and wellness, brain fitness, Alzheimer’s, care partner techniques, tips for choosing a senior living community and more. The second phase of the new site launch, scheduled for later this fall, will incorporate reviews and ratings, live chat and more accessibility for mobile devices. Additional features will be added in 2017, including a feature that will enable family members involved in the decision process to share information with each other via the site. 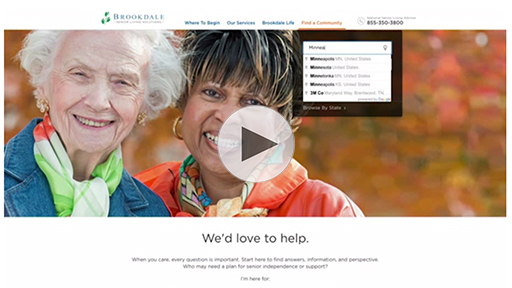 “Ultimately, Brookdale’s website will be a comprehensive and personalized experience for seniors and family members to make the best decision possible, anywhere they are on their journey,” said McCamish. Brookdale Senior Living Inc. is the leading operator of senior living communities throughout the United States. The Company is committed to providing senior living solutions within properties that are designed, purpose-built and operated to provide the high quality service, care and living accommodations for residents. Currently Brookdale operates independent living, assisted living, and dementia-care communities and continuing care retirement centers, with approximately 1,114 communities in 47 states and the ability to serve approximately 107,000 residents. Through its ancillary services programs, the Company also offers a range of outpatient therapy, home health, personalized living and hospice services.